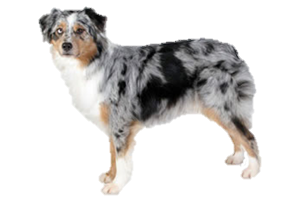 The Australian Shepherd is a herding breed that was developed to work with large flocks of sheep. They can also be trained to work with cattle and other livestock. Today they are popular with ranchers around the world and are commonly kept as companions. The name "Australian" Shepherd is extremely misleading, for this breed was developed in the United States and its ancestry does not originate from there either. It is believed their history begins with Pyrenean Shepherds from Europe that accompanied their charges to Australia. Once there these dogs were crossed with different types of collies (both Borders and Smooth Collies have been mentioned) before being taken to California. Since they arrived with Australian sheep ranchers assumed the dogs were from the same continent, which cause the confusion of their name. Further development would continue and other crosses added until the type became fixed. Today there is also a small version, the Miniature American Shepherd.